Rebuilding or replacing an engine can seem like a daunting task without the proper resources. The Motor Bookstore carries a wide selection of engine building books designed to guide you through the process with detailed procedures and clear photographs ideal for any DIY home mechanic. Find practical methods on how to blueprint an engine, or build on the fundamentals to learn auto mechanics. DVD tutorials, repair manuals, and step-by-step engine building guides make it easy for you to rebuild your engine the right way. Engine Airflow: Theory, Flow Bench and Parts Testing, etc. V-8 Horsepower Performance Handbook: Block, Crank, Heads, Pistons, Valves, Camshaft, etc. When it comes to a full-scale build or rebuild - even if you're an expert mechanic - there's no need to tackle the job alone. Our resource materials are a mechanic's best friend when it comes to acquainting you with every critical cubic inch of the engine project you'll soon be undertaking. Our inventory of math and physics reviews, service manuals and engine rebuilding books are available for cars, trucks, vans and SUVs of all makes and models, foreign or domestic. Find the resources you need for Chevrolet, Chrysler, Dodge, Ford and Honda engines. Take pride in your vehicle, keep it on the road longer and make high performance modifications to your baby. Don't be afraid to get your hands dirty and become an automotive do-it-yourselfer. Take care of everything from your basic oil change to replacing a blown gasket and getting your car ready for racing. Tune your engine, troubleshoot for normal wear and tear, perform an engine swap or add some horsepower to that bad boy. Clear photographs and detailed, step-by-step procedures make it easy to figure out how to rebuild an engine block for your particular make and model. Maybe you're not ready to take on the task of engine building yourself. Our detailed manuals are an excellent way to learn more about your vehicle to become a more knowledgeable consumer. Use manuals and guides as a way to familiarize yourself with the basic mechanics of your vehicle. This extra effort can help you avoid unnecessary part changes and labor costs when working with a questionable mechanic. A better knowledge of your automobile will help you learn when and how to perform routine maintenance procedures to keep it purring longer. Grab an engine building book, DVD guide or basic repair manual from The Motor Bookstore to become your own mechanic. Above: Larry Capalbo & Bill Grant's engine installation in one of our Factory Five Cobra kit cars. 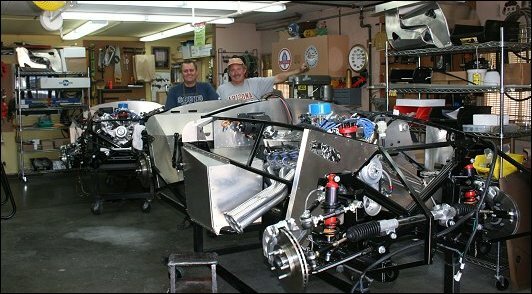 The second photo shows Larry's workshop and the two FF5 kits being built. Garden Grove, CA.